Mtech Lite uses the South Loop which is approximately ¾ mile. Used for Formula Renault Driving Experiences. 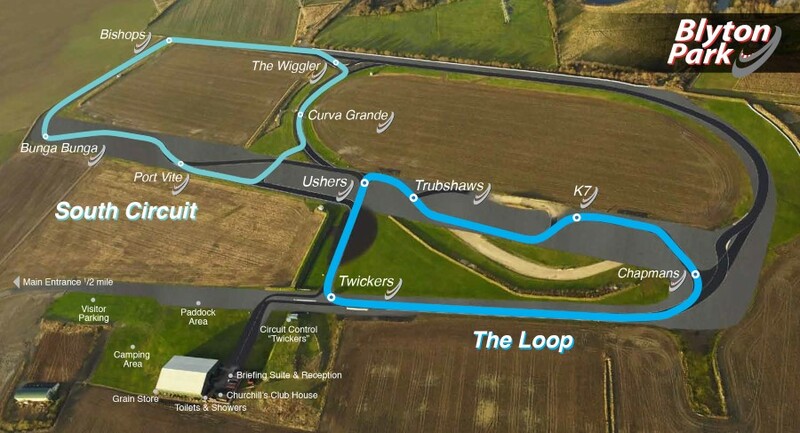 ‘In May 2011, a new circuit opened on the site of the former RAF Blyton, five miles North of Gainsborough in Lincolnshire. The old tarmac laid by the US Air Force after the war was planed and a new tarmac surface was cut into it. Do NOT put the Blyton Park post code into a sat-nav. You will get lost!!! Blyton Park is approximately five miles North of Gainsborough in Lincolnshire. The venue is one mile from Blyton village on the B1205 (Kirton Road) and approaching from Blyton the entrance is a mile from the village on the left-hand side. There are big signs on both sides of two heavy steel gates and a derelict wartime brick shed next to the entrance. Go through the gates and follow the track past the grass track on your left. Keep going past a derelict farm and park by the big grain store (green) on your right. You will see a café in a lay-by on your left-SLOW DOWN and turn left signposted Pilham and Blyton. If you get to Corringham you have missed the turn! In Blyton turn right onto B1205 and we are one mile on left. From M1 approx. 1 hour, From A1 30 min. Exit M1 at Junction 21A and follow A46 to Newark. Take A113 and then A156 to Gainsborough. Blyton Park is 1 mile on the left. Exit the M180 at Junction 4 and take A15 towards Lincoln. After the Level (?) Crossing at Northorpe you are 1 mile from Blyton Park entrance which will be to your right. From M180 approx. 20 mins.